When Texas A&M alum Martin Piller took the turn Sunday during the final round of the Nationwide Tour's 2010 Stadion Athens Classic at UGA (the University of Georgia), he stood two shots back of leader Daniel Summerhays. By the time they got to 72nd hole of the tournament, they were tied at 12 under par. When Summerhays took too much club and hit his ball through the green on the right side, Piller stuck to his game plan and went for the pin. All week long, players in the field said that if you missed the green on any hole, you were in trouble. True to this statement, Summerhays failed to get up and down. 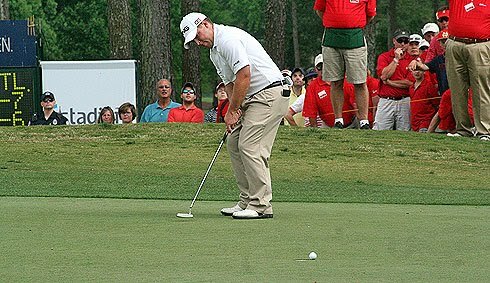 The Agony of Defeat: 3rd Round Leader Daniel Summerhays left his par putt left on the 72nd hole of the Nationwide Tour's 2010 Stadion Athens Classic at UGA, allowing Martin Piller to two-putt for the victory on Sunday, May 2, 2010. Eye on Sports Media/2010. In fact, his chip shot went long and gave him the three most dreaded words in this situation: "You're still away!" As Piller watched, Summerhays missed his par putt. All Piller had to do was lag his putt up close for a tap-in and hist first Victory on the Nationwide Tour. Here is a slideshow from the final round on Sunday, May 2, 2010. Special thanks to event media director Bryan Harris of Jackson-Spalding and Brian Brodrick of Jackson-Spalding for working with Eye on Sports Media for the second year now in providing a credentials for myself and my junior photographer (her pictures will be up soon) to cover this event.